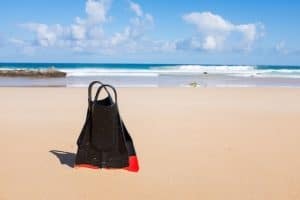 So you've booked in your next snorkelling adventure, picked yourself a mask and snorkel set and some fins. 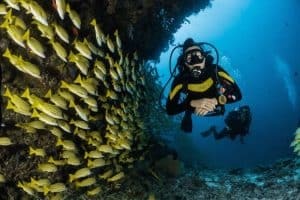 If you're serious about capturing the best moments of your trip, you're going to want a good quality underwater camera. Below we outline the key features you should look for when you’re on the hunt for a waterproof camera, along with some of our recommended products on the market. 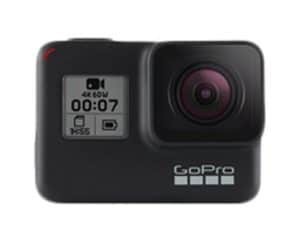 Note that the cameras discussed here are considered rugged compact, or action sport cameras, and generally have a waterproof rating of 10-30m, making them perfect for snorkelling or other shallow water sports. If you are looking for a camera for diving you will need to invest in waterproof housing that can withstand more extreme depths. When you’re in the water or out on any other adventure, you don’t want to be mucking around with settings every time you want to take a photo. Therefore it’s important to choose a camera that comes with inbuilt shooting modes, such as low-light, or full auto mode, that will suit your requirements. This can be quite subjective as is dependant on many factors. 4K Video is the best available, while 1080p is still perfectly acceptable for most uses. For stills, it’s a combination of megapixels (MP), lens and sensor quality. It’s important to remember that higher MPs don’t always translate to higher quality photos. Unless you are using a tripod (unlikely under water! ), then you’re going to want built in image stabilisation to reduce blur associated with your hand moving. All of the cameras on this list come with image stabiliser technology. Optical zoom refers to the physical zoom of the lens. Generally, the higher the optical zoom, the more bulky the camera. Around 4-5x is standard for these types of cameras. If you want to do any post processing in software such as lightroom or photoshop, you’re going to want to shoot in RAW mode (in contrast to your standard photos which come in JPEG). Not a deal breaker for most people but something to keep in mind. 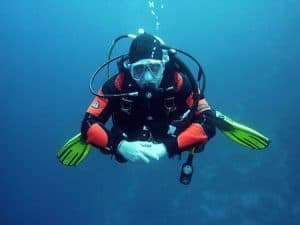 Of course, if you’re going to be using your camera for snorkelling or other water activities, you need to know how deep you can take it. Those in this review have a minimum rating of 10m so should all be perfectly suitable for snorkelling. 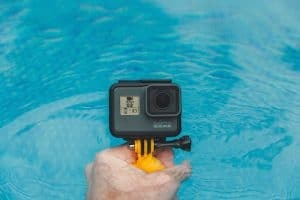 "If you're after an general purpose action camera for shooting videos (all of which are either waterproof or can be used with a waterproof housing), then be sure to check out our write up on The Best GoPro Alternatives." 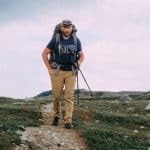 ​A very impressive, super tough, multi-purpose adventure camera, the TG-5 is packs a lot of performance into a small package. It’s high speed lens combined with aperture f-stop of 2.0 means fast shutter speeds, which translates to crisp, clear images, even when the subject is moving. The TG-5 has a 12MP still camera and records video in super high definition 4k. It also provides the ability to shoot in RAW mode, improving the options for post-processing in software such as lightroom. Optical zoom is 4x. It is waterproof to 15m, dustproof, shockproof from 2.1m, and freezeproof to -10c. It also comes with built in GPS and eCompass, a temperature sensor, WIFI for loading and sharing, anti-fog lens. Olympus claim a battery life of 340 shots in still mode. The latest release from the kings of the action camera world, the Hero 7 from GoPro represents a massive step up from the previous version and is a great option for anyone serious about capturing their underwater adventures. The Hero 7 has a 12MP sensor for stills and super high definition 4K video, allowing super slow-mo replays. It offers touch screen and voice controls (great if wearing bulky gloves). The built in image stabiliser eliminates blur, while various modes such as night mode will adjust settings to make the most of whatever light is available. The Hero 7 is waterproof to 10m with no need for separate waterproof housing like previous versions. 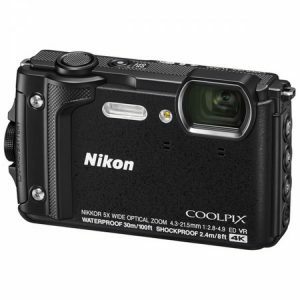 ​The Coolpix is another great option in the “tough camera” market, at a similar price point to the Canon TG-5. It has a 16MP sensor, 5x optical zoom and a bright f/2.8 lens to assist with sharp photos even in low light. It also has a flash which isn’t always included on this type of camera. It is waterproof to 30m, dustproof, and freezeproof to -10c. It has WIFI, GPS, a barometer to provide altitude and depth data, and an electronic compass. It also shoots video in 4K. One downside of the W300 vs the TG-5 is that it doesn’t have the option to shoot in RAW mode. Overall, a great all-around and camera which should definitely be an option for anyone in the market for a waterproof/rugged compact. Nikon claim a battery life of 280 shots. 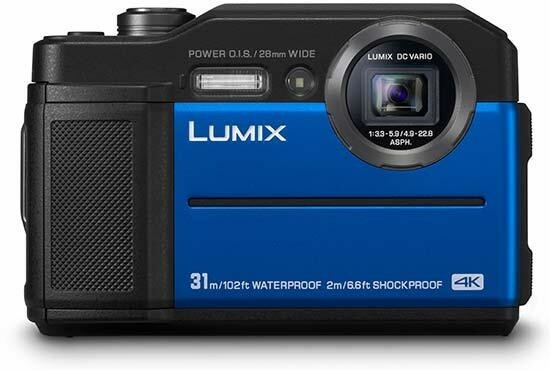 ​Another solid contender in the rugged camera market, the FT7 from Lumix has great waterproofing, an impressive 20.4MP sensor, and 4K video. It is Dustproof, and freezeproof to -10c. It’s optical zoom of 4.6x sits in between it’s closest rivals, the TG-5 and W300. It is also the first rugged camera with Electronic View Finder (EVF), which provides a more accurate view of how the photo will be rendered. Battery life is 300 still photos. 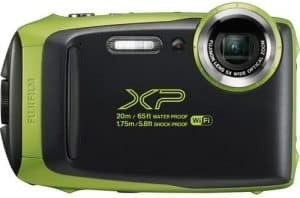 A super popular option for casual photography, the XP130 provides incredible value for money, and with a waterproof rating of 20m, 16MP sensor, and built in image stabilisation, it certainly holds it’s own against the big boys. The XP130 takes great quality underwater photos, has HD Video Recording, and is WIFI enabled. Drawbacks include max aperture of f/5.0 meaning less light available to the sensor, and video of 1080p as opposed to 4K as included in the higher end options. At the end of the day if we could only pick one of these cameras we’d go with the TG-5 because of it’s high specs, great image and video quality, and compact size. However they are all great options - it’s just a matter of finding the best one to suit your needs. What about disposable underwater cameras? If you’re not looking to invest in a digital camera, a waterproof disposable camera may be the best option. Manufactured by FujiFilm, the most popular option on the market is the Quick Snap Waterproof. Be sure to factor in both the cost of film and developing if you choose to go with a disposable option. You can never be too cautious with electronics, so it’s a great idea to make sure your fishing camera is waterproof. 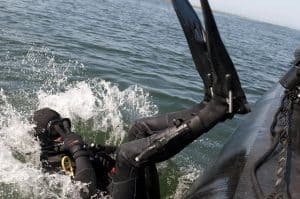 Given it’s unlikely to be used underwater, you’ll want to prioritise image quality and ease of use over anything else. 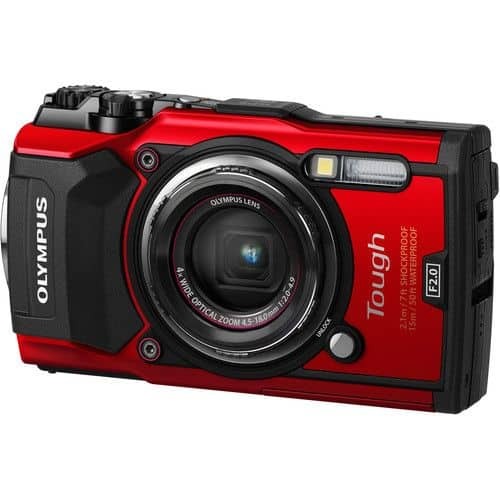 Our top pick, the Olympus Tough TG-5 would be great option, as would the Fuji Finepix if you’re on more of a budget. Waterproof cameras are a great way for kids to learn about photography and capture some holiday memories, not to mention keeping them entertained for a few hours. The Fuji Finepix would be a great option here due to it’s high quality image stabilisation, crisp images, and affordable price point.